This passion started in 1957 by my grandfather Guido who lived in the heart of Tuscany. Nowadays, thank to the flavours and the scents known in my childhood. 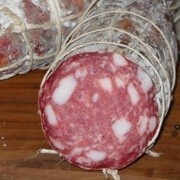 I still produce sausages and salami respecting the traditional family methods.